First: Nonviolence is the way of the strong. Second: The goal of nonviolence is redemption and reconciliation. Third: Nonviolence seeks to defeat evil, not people. Fourth: Nonviolence includes a willingness to accept suffering without retaliation, to accept blows from the opponent without striking back. King writes, “The nonviolent resister is willing to accept violence if necessary, but never to inflict it. Unearned suffering is redemptive. Suffering, the nonviolent resister realizes, has tremendous educational and transforming possibilities.” That’s a tough pill to swallow but King insists that there is power in the acceptance of unearned suffering love, as the nonviolent resister Jesus showed on Calvary and Dr. King himself showed in his own life and death. Fifth: Nonviolence avoids not only external physical violence but also internal violence of spirit. Nonviolence is the practice of agape/love through action. “The nonviolent resister not only refuses to shoot his opponent; he also refuses to hate him. At the center of nonviolence stands the principle of love.” Cutting off the chain of hate “can only be done by projecting the ethic of love to the center of our lives.” Love means “understanding, redemptive good will toward all people.” For King, this agape/love is the power of God working within us, as Watley also explains. That is why King could exhort us to the highest possible, unconditional, universal, all-encompassing love. King the preacher believed that God worked through us when we used the weapon of nonviolent love. Sixth: Nonviolence is based on the conviction that the universe is on the side of justice. 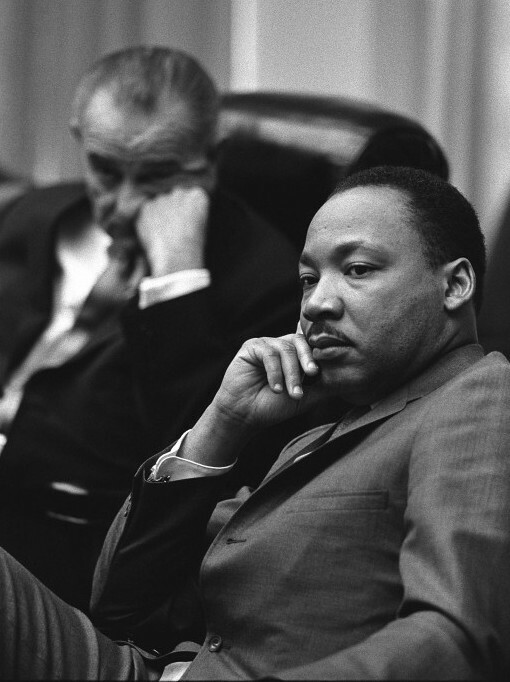 “The believer in nonviolence has deep faith in the future,” King writes. “He knows that in his struggle for justice he has cosmic companionship. There is a creative force in this universe that works to bring the disconnected aspects of reality into a harmonious whole.” King’s philosophy, spirituality, theology and methodology were rooted in hope. These core principles explain why, for King, nonviolence was “the morally excellent way.” As he boldly expanded his campaign from Montgomery to Atlanta, Albany, and eventually Birmingham, he demonstrated six basic steps of nonviolent action that could be applied to any nonviolent movement for social change. We need to do our homework, and learn everything we can about the issue, problem or injustice so that we become experts on the topic. Then we do our best to inform everyone, including the opposition, about the issue, and use every form of media to educate the population. As we engage in the public struggle for nonviolent social change, we renew ourselves every day in the way of nonviolence. As we learn that nonviolent struggles take time, we commit ourselves to the long haul and do the hard inner work necessary to center ourselves in love and wisdom, and prepare ourselves for the possibility of rejection, arrest, jail or suffering for the cause. We try to engage our opponent, point out their injustice, propose a way out, and resolve the situation, using win-win strategies. If necessary, we take nonviolent direct action to force the opponent to deal with the issue and resolve the injustice, using nonviolent means such as boycotts, marches, rallies, petitions, voting campaigns, and civil disobedience. EDITOR’S NOTE: John Dear has been nominated five times for the Nobel Peace Prize, most notably in 2008 by Archbishop Desmond Tutu; but that does not tell a fraction of his story. One of the most prominent peace activists in the world, he has been arrested more than 75 times for peace and nonviolent protests. He was Executive Director of Fellowship of Reconciliation (1998-2001) and founder of the Bay Area Pax Christie. He has received several peace awards, including the Pacem in Terris Peace and Freedom Award 2010. He is a prolific writer. Among his works are: Disarming the Heart: Toward a Vow of Nonviolence; Our God Is Nonviolent: Witnesses in the Struggle for Peace and Justice; Seeds of Nonviolence; etc. We are very grateful to John Dear for permission to post this profound and important essay and recommend his website for a more extensive bibliography, and to read other of his articles, speeches, and sermons.